Zones of social abandonment are emerging everywhere in Brazil’s big cities—places like Vita, where the unwanted, the mentally ill, the sick, and the homeless are left to die. This haunting, unforgettable story centers on a young woman named Catarina, increasingly paralyzed and said to be mad, living out her time at Vita. Anthropologist João Biehl leads a detective-like journey to know Catarina; to unravel the cryptic, poetic words that are part of the “dictionary” she is compiling; and to trace the complex network of family, medicine, state, and economy in which her abandonment and pathology took form. An instant classic, Vita has been widely acclaimed for its bold fieldwork, theoretical innovation, and literary force. Reflecting on how Catarina’s life story continues, this updated edition offers the reader a powerful new afterword and gripping new photographs following Biehl and Eskerod’s return to Vita. 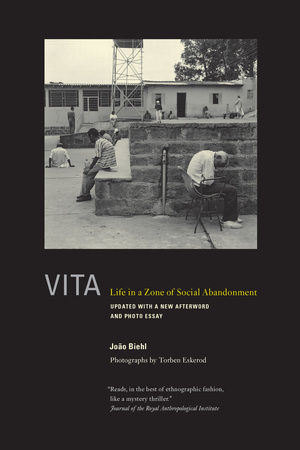 Anthropology at its finest, Vita is essential reading for anyone who is grappling with how to understand the conditions of life, thought, and ethics in the contemporary world. João Biehl is Professor of Anthropology at Princeton University. His website is www.joaobiehl.net. Torben Eskerod is an artist and works as a freelance photographer in Copenhagen. "To want my body as a medication, my body"